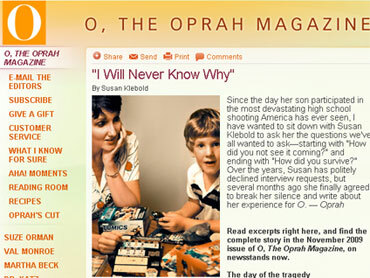 Photo: Screen capture of Oprah Magazine shows Susan and Dylan Klebold celebrating Dylan's fifth birthday. DENVER (CBS/AP) In an essay in the upcoming issue of "O, The Oprah Magazine," Susan Klebold, the mother of Columbine killer, Dylan Klebold, says she is "haunted by the horror and anguish" her son caused and didn't realize he was so disturbed. On April 20, 1999, Dylan Klebold and Eric Harris stormed into Columbine High School in suburban Denver armed with shotguns, pistols and homemade bombs. They killed 12 students and a teacher in a shooting rampage that ended in their own suicides. Twenty-four others were injured in the melee and the resulting panic to escape. In the first detailed public remarks by any parent of the two Columbine killers, Susan Klebold says she had no idea her son was suicidal until she read his journals after the 1999 high school massacre. "Dylan's participation in the massacre was impossible for me to accept until I began to connect it to his own death," she wrote in excerpts released by the magazine ahead of Tuesday's publication. "Once I saw his journals, it was clear to me that Dylan entered the school with the intention of dying there. And so in order to understand what he might have been thinking, I started to learn all I could about suicide." The killers' parents have repeatedly declined to talk about the massacre. They gave depositions in a lawsuit filed by families of the victims, but a judge in 2007 sealed them for 20 years after the lawsuit was settled out of court. 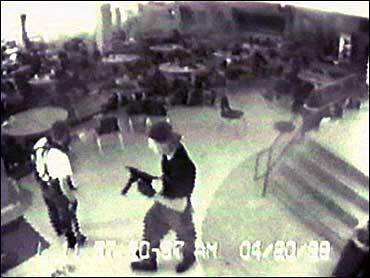 Photo: Eric Harris, left, and Dylan Klebold, carrying a TEC-9 semi-automatic pistol, are pictured in the cafeteria at Columbine High School. In her essay, Susan Klebold wrote about her own struggle to reconcile the son she loved with the horror he caused. "For the rest of my life, I will be haunted by the horror and anguish Dylan caused," she wrote. "I cannot look at a child in a grocery store or on the street without thinking about how my son's schoolmates spent the last moments of their lives. Dylan changed everything I believed about myself, about God, about family, and about love." In a statement with the essay, Oprah Winfrey wrote that Susan Klebold has turned down repeated interview requests, but finally agreed to write an essay for her magazine. A spokeswoman for the magazine said Klebold was not paid for the essay, and there were no plans for her to appear on Winfrey's television show. A Klebold family spokeswoman said there would be no further statements. In the essay, Klebold said her son left early for school on the day of the shootings. "Early on April 20, I was getting dressed for work when I heard Dylan bound down the stairs and open the front door. Wondering why he was in such a hurry when he could have slept another 20 minutes, I poked my head out of the bedroom. 'Dyl?' All he said was 'Bye.' The front door slammed, and his car sped down the driveway. His voice had sounded sharp. I figured he was mad because he'd had to get up early to give someone a lift to class. I had no idea that I had just heard his voice for the last time." 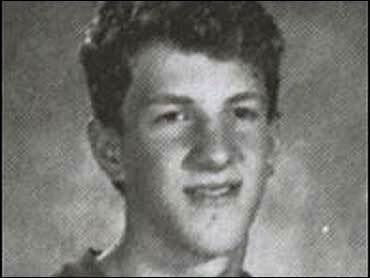 Photo: Dylan Klebold is shown in a 1998 yearbook photo from Columbine High School. She said she had "no inkling" how sick her son was. "From the writings Dylan left behind, criminal psychologists have concluded that he was depressed and suicidal. When I first saw copied pages of these writings, they broke my heart. I'd had no inkling of the battle Dylan was waging in his mind."